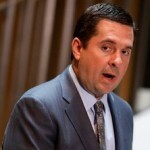 Calls are growing for House Republican Intelligence Committee Chair Devin Nunes to step down from his committee’s investigation into possible collusion between the Trump campaign and Russia. On Tuesday, the committee was scheduled to hear testimony from former acting Attorney General Sally Yates. But Nunes canceled the hearing last week. Trump’s son-in-law Jared Kushner has agreed to testify to the U.S. Senate committee investigating ties between the Trump campaign and Russia during the 2016 election. He may also face questioning over a December meeting with the head of a U.S.-sanctioned Russian state development bank known as VEB. President Obama imposed the sanctions in 2014 over Russia’s military actions in Ukraine. The bank disclosed the meeting on Monday and said Kushner was acting as “the head of Kushner Companies.” This information contradicts the statements of White House Press Secretary Sean Spicer, who said on Monday that Kushner was acting as a Trump adviser during the meeting, not as a private developer. The revelations came on the same day Kushner agreed to testify to the Senate committee. Trump signed an executive order Tuesday to dismantle a slew of climate rules established by President Obama. If carried out, the executive order will virtually guarantee that the United States will fail to meet its 2015 Paris Agreement pledge to reduce emissions in order to curb the effects of climate change. The executive order marks the first step to undo Obama’s Clean Power Plan to limit emissions and replace coal-fired power plants with new solar and wind farms. On Tuesday, the House narrowly voted to allow internet providers to sell your web browsing history and other personal information. The vote will give companies like Verizon, Comcast and AT&T more power to collect people’s sensitive data, including their internet browsing history, and to sell this information. Last week, the Senate also approved the measure in a vote largely split across party lines. Trump is expected to sign the bill.